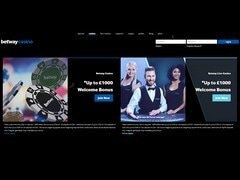 Betway is what you might refer to as a full-service operation, because it operates a sportsbook and poker room, in addition to the top-flight Betway Casino. Licensed in Malta, it uses only the best when it comes to software, and wants to make sure it speaks your language, 24 hours a day. With an aggressive Betway online casino bonus structure, it appears to be a destination well worth investigating. The welcome bonus is quite generous, paying a 100% match on first-time deposits all the way up to $250. The Betway Casino bonus has a reload feature as well; on the second deposit, you can get 25%, up to $250, and on the third deposit, 50% up to $500, which brings the total of the Betway online casino bonus up to a potential $1000. This casino does not offer a Betway Casino Bonus Code, because the software developer does not make provisions for it, but you can keep up with all the latest bonus information by clicking through the links that are available on our website. Betway Casino goes right to the top of the list when it comes to its suite of games. That's because it uses Microgaming, which in the minds of many is the premier online casino software producer in the world. When you play with Microgaming that means you are going to have the maximum of options at your disposal, which includes AutoPlay on slots and other selected games, as well as play tracking. There are fourteen different versions of blackjack you can try, as well as a roulette collection that includes American, French and European, as well as the Roulette Royale progressive game. You can play 21 different video poker games, and there are over 200 slot machine games as well. You could go for weeks and weeks and never play the same game twice. Nine progressive games are featured, with the running jackpots on display. If you don't want to download the casino, you can take advantage of the instant play version. Visa and MasterCard are always available for deposits, as are bank transfers. There are also a lot of e-wallets you can use for depositing - the roster includes Neteller, ClickAndBuy, Click2Pay, PaySafeCard, EntroPay, WebMoney, and several other geographically-based options, including Przelewy 24, iDeal, Poli and eKonto. We always like the idea of getting generous bonus money on the first three deposits, and the Betway Casino bonus is very strong in that regard. This is the place to play some slots, and from what they're saying, they have made a lot of people rich; they claim fifteen millionaires from progressive jackpots. You can get customer support through every conceivable way - email, telephone contact and live chat - 24 hours a day. And they will deal in seventeen different languages in all. As we mentioned, there's no Betway Casino Bonus Code, so the best thing for you to do is follow the links on our website and you'll be kept up to date on all the latest bonus and promotion information.